Beam is one of the most important structural parts of a building. In our previous article, we have already discussed different types of beams used in construction. In this article, we will discuss the differences between primary, secondary and tie beam. The beams that are connecting columns for transferring loads of a structure directly to the columns are known as primary beams. Usually, primary beams are shear connected or simply supported and they are provided in a regular building structure. The depth of the primary beams is always greater than secondary beams. 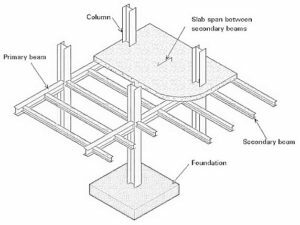 Primary beam act as a medium between columns and secondary beams. The beams that are connecting primary beams for transferring loads of a structure to the primary beams are known as primary beams. These beams are provided for supporting and reducing the deflection of beams and slabs. 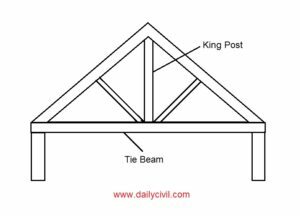 The beams that are connected by two or more rafters in the roof or roof truss for stiffening the whole building structure, known as tie beams. These beams do not carry the vertical load of slab or walls instead carry the axial compression. Generally, tie beams are used in roof truss or in damp proof course at the plinth level. Liked This Article? Then You Must Be Interested In Subscribing Our Newsletter. It’s nice study, need calculation for columns, slabs (suspended/ none suspended), beams, steel design, timber design and concrete design. I am a civil engineer.I have dout about beam. How many bar/crack bar to provide in 15″ * 10″ beam.